Olli Maki, a former European junior welterweight champion, died earlier this month at a nursing home in a Helsinki suburb at age 82. News of his passing on April 6 unleashed a flood of bittersweet memories. Maki wasn’t a great fighter. He finished his career with a record of 28-14-8. But he participated in an historic fight and he and his opponent Davey Moore became parcels of popular culture, transcending boxing, in Moore’s case posthumously. Maki, a Finn, a baker by trade, was the house fighter in the first world title fight ever staged in Scandinavia. The date was August 17, 1962, and the venue was Helsinki’s Olympic Stadium. Although Maki had a strong amateur background, he had only 11 pro fights under his belt. Moore, the reigning world featherweight champion, hailing from Springfield, Ohio, was 56-6-1 and making his fifth title defense. Making matters even more daunting for Maki, he wasn’t a natural featherweight. He had to boil off considerable weight to make 126 pounds and the endeavor eroded much of his strength. This was of little concern to the promoter, however. A local man, his priority was in creating a grand event, a spectacle. He picked Davey Moore not only because Moore held the title but because his name resonated with many of the locals. Davey had participated in the 1952 Helsinki Olympics, advancing to the third round. As a spectacle, Maki vs. Moore turned out pretty well. The event attracted more than 25,000 (23,643 paid). As a fair competition, however, the contest failed miserably; Olli Maki had no business being in the same ring with Davey Moore. The Finn was blasted out in the second round, a left-right combination knocking him on the seat of his pants and a second one-two putting him down again and leaving him too woozy to continue. If you’re thinking of moving to Finland, the country has many plusses. There’s very little crime, health care costs are low, life expectancy is high and Finland, home to Nokia, is one of the most technologically advanced countries in the world. But be advised that it gets cold there. The average high temperature in Helsinki in August is 66 degrees and this is the second warmest month of the year. Although Maki vs. Moore was held in mid-August, there was a chill in the air. In fact, referee Barney Ross was shivering as he stood at the back of the ground level seats waiting for the ring to be cleared following the last preliminary bout. Yes, this was that Barney Ross, the former lightweight, welterweight, and junior welterweight world champion. The Finns were in a festive mood but had nothing to cheer about from that point on. When the Moore-Maki fight was announced, boxing aficionados groaned. They were hoping that Moore would proceed straightaway to a match with a young Cuban fighter turning heads, Ultiminio “Sugar” Ramos. The clamor for a Moore-Ramos fight was most intense in Ramos’s adopted home of Mexico City where a powerful new organization was emerging to challenge the hegemony of the WBA, the World Boxing Council (the IBF and WBO hadn’t yet been born). Moore vs. Ramos came to fruition on Thursday, May 21, 1963 at Dodger Stadium in Los Angeles. The bout was witnessed by an announced crowd of 28,800 and a national television audience. Both the WBA and WBC belts were at stake. While other entities such as the New York and Pennsylvania commissions had flouted the WBA and ordained their own “world champions,” this was the first true unification fight in the featherweight division. Sugar Ramos, 21, was 38-1-3 with 29 knockouts. His only loss came by disqualification. But Moore, 29, was riding a 20-fight winning streak and was chalked the favorite. The fight was a humdinger. Moore had Ramos down and almost out in the second and seventh stanzas, but the young Cuban emigrant had more fuel in his tank and came back to stop Moore in the 10th. The final punch knocked Moore into the ropes, causing the ropes to vibrate. As he fell, the nape of his neck struck the bottom strand of ropes. He was saved by the bell but his manager Willie Ketchum decided that Moore had had enough and called the fight off. Forty minutes after the fight, after conversing with reporters, Moore collapsed and was rushed to White Memorial Hospital where doctors determined that the comatose fighter, the son of a minister, had swelling on his brain stem consistent with a whiplash injury. His wife of 11 years, Geraldine, the mother of his five children, was with him in Los Angeles but hadn’t attended the fight. She could never bear to watch her husband fight. At the hospital, she maintained a bedside vigil. I am very sorry the young man whispered in a choked voice. Then Ramos bowed his head, unable to go on. He began to sob softly. I want you to understand I’m not blaming you for anything, replied Mrs. Moore. It was God’s act. I’m praying every night, said Ramos, and I’ll continue to pray every night. I want to help in any possible way for Davey to recover. With that, the saddened fighter began to weep again. Ultiminio “Sugar” Ramos and Moore’s widow Geraldine would hook up once again and here the bitter saga of Davey Moore is leavened with sweetness. In 2013, 50 years after Moore’s fatal injury, Ramos, then 71 years old (he died in 2017), was inspired to go to Moore’s grave and pay his respects. It was on his bucket list. 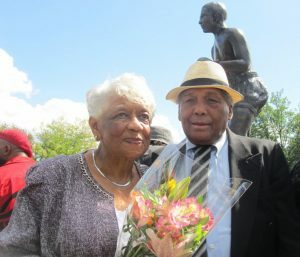 He contacted Geraldine Moore who still resided in Springfield and learned that a statue of Moore would be unveiled in September. Ramos promised to be there at the unveiling. It was a long and arduous trip from Mexico City, what with airplane transfers and the drive in from Indianapolis, 130 miles away. Along the way, Ramos picked up a friend, Luigi Meglioli, a man with a better command of English. Meglioli owned a ceramic tile company in Tijuana. When they arrived in Springfield at the meeting place, Ramos was holding a bouquet for Geraldine and Meglioli a pot of lilies to be laid at Davey Moore’s cemetery plot. The great Dayton Daily News columnist Tom Archdeacon, the dean of sportswriters in southwestern Ohio, led the fund-raising campaign to have the statue sculpted and then have it bronzed. This took a while. Clark County, home to Springfield, sits in America’s Rust Belt and has seen better days. Archdeacon was there to record the moment when Sugar Ramos and Geraldine Moore were reunited after all those many years and this too was a poignant moment. Ramos was apprehensive. Davey Moore’s children were all grown now. How would they react to the man whose fists had killed their father? But when the little man in the straw fedora emerged from his vehicle, his countenance betraying his qualms, Geraldine recognized him and rushed to greet him, to assure him that he come to a place where he was welcome. When the tarp was removed from the statue, they stood side-by-side, their arms linked, their faces streaked with blissful tears. Olli Maki persevered after being shellacked by Davey Moore. Eighteen months later, fighting at his more natural weight, he won the European 140-pound title with a 15-round decision over Germany’s Conny Rudhof. He lost the title in a rematch with Rudhof and failed to regain it when he lost a 15-round decision to the artful Spanish campaigner Pedro Carrasco who was in the midst of a 91-fight unbeaten streak. In retirement, Maki kept his hand in the sport as a coach and boxing official. In the days leading up to his fight with Moore, Olli Maki was a national hero, as celebrated as the famous long distance runner Paavo Nurmi. His story touched a nerve with Juho Kuosmanen, a young Finnish filmmaker. Kuosmanen directed and co-wrote “The Happiest Day in the Life of Olli Maki” which won a major award at the 2016 Cannes Film Festival. I have not seen the movie, but I gather that the title was meant to be ironic. As the fight draws near, Maki, played by Jarkko Lahti (pictured), feels more and more put-upon as he is hustled from one meet-and-greet to another by the venal promoter as he puts the finishing touches on the advertising campaign. The frenetic schedule imposed upon him leaves him virtually no time to spend with Raija, the girl with whom he has fallen in love. 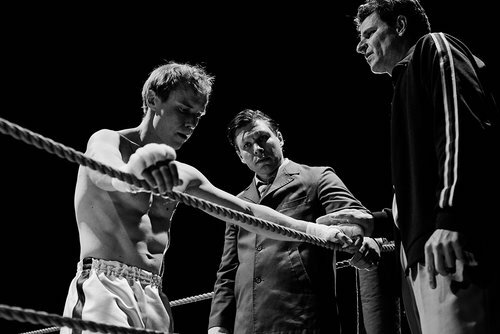 At its heart, “The Happiest Day….” isn’t a boxing movie but a love story. “Raging Bull” it is not. The real Olli Maki and his wife Raija make a cameo appearance at the end of the movie. Back in 1962 when they crossed paths in Helsinki, no one would have guessed that someday songs would be written about Davey Moore and that a statue, 8-feet-tall, would be erected to honor him. Nor would anyone have suspected that many years later Olli Maki would be immortalized in a critically acclaimed movie that had his name in the title. Boxing is funny that way. With the passage of time, some seemingly ordinary events become larger, perhaps even monumental. And when they do, they invariably awaken bittersweet memories.